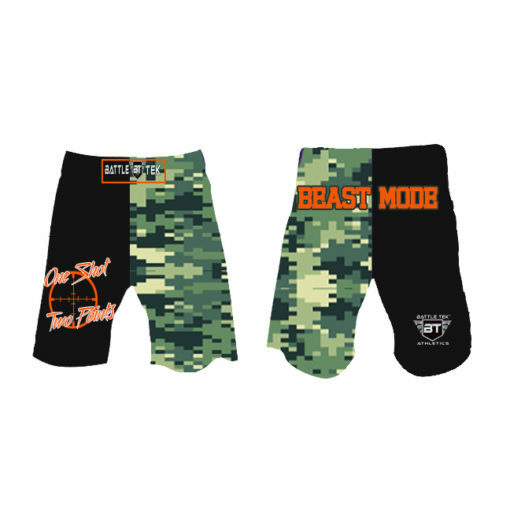 Beast Mode Fight Shorts by Battle Tek Athletics are 100% Microfiber Polyester fully sublimated so they will not fade, crack or peel. They are constructed to provide flexibility for easy maneuvering in competitive and non-competitive events. These fight shorts are perfect for MMA and for grappling sports. A perfect complement to our matching singlet and performance tee. Battle Tek Beast Mode Fight Shorts are made of 100% Microfiber Polyester. The design is fully sublimated to ensure the best quality which will never fade, crack or peel. Our shorts are constructed with titanium stitching, stretch waist band, Velcro closure, drawstring and separate crotch spandex area for the most flexibility. Matching singlet and performance tees for sale online as well. All shorts with a “Y” prefix are found in the Youth Bottoms Category. 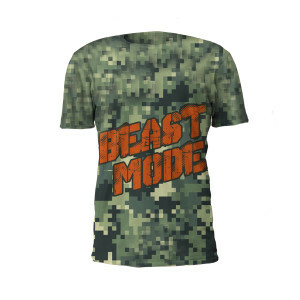 Battle Tek Beast Mode Shorts offer a wide range of movement in all the sizes above.